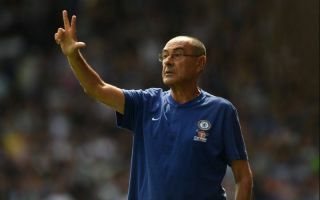 Chelsea boss Maurizio Sarri insists that his team must get better at defending high up the pitch in order to achieve their targets this year. The Blues are third in the Premier League after 10 matches and three points behind leaders Liverpool, with a game in hand against Crystal Palace on Sunday. Sarri’s men have surprised everyone to emerge as challengers for the title, making huge strides forwards under their new Italian coach after last year’s fifth-place league finish. A win against Palace would see the Blues move one step closer to the top, with second-placed Manchester City also in action against Southampton at the Etihad. According to Sarri, Chelsea still need to improve in one key area to fight for silverware on all fronts in the coming months, namely in the way they set up to defend. “We have quality, technical qualities, and we need to improve the defensive phase, otherwise we are not a solid team,” The 59-year-old head coach told Sky Sports. “And if you are not a solid team you cannot have very important targets. “When I say defensive phase I am not talking about the defensive line, I am talking about all the team because it’s very important for us to defend in the opponent’s half and have the ball there. The Blues have only conceded seven league goals to date, but they did look vulnerable in their last big domestic clash, during a 2-2 draw against Manchester United at Stamford Bridge. They will be at home once again this Sunday against the Eagles and will be expected to win comfortably, but they cannot afford any lapses in defence with Wilfried Zaha primed and ready to pounce for the visitors. Sarri will equal former Nottingham Forest boss Frank Clark’s 24-year-old record of remaining unbeaten in his first 11 matches in the Premier League if he can avoid defeat, but Blues supporters will surely settle for nothing less than three points.